As a rather petite gal, I love short jackets because longer jackets tend to make me look short and stubby.When wearing a short or crop jacket, I love to layer to create texture and dimension to the outfit. 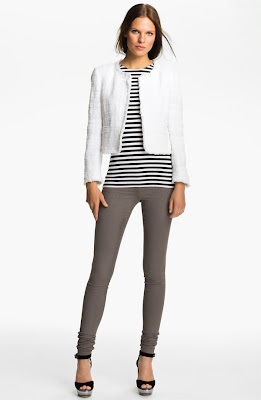 Doesn't this Alice + Olivia boucle jacket looks lady-like and elegant. Very Chanel-ish. 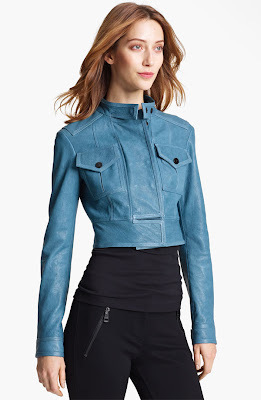 ($495 via nordstrom.com) I hope this jacket comes with a matching skirt. This J Crew jacket reminded me of a Chanel jacket from long long time ago. The Chanel piece was even short. I think this J Crew is more practical. It is on sale now for $198. I was surprised to find this bright piece at Ann Taylor. It is very stylish and just perfect for a modern gal. On sale now too for $109 at Ann Taylor. Do you like short/crop jackets? I miss the days when I could pull off a short jacket. Now I need a long jacket to hide my extra 30. Sigh. I used to hate cropped jackets but a few years ago I ventured to try one on (with short sleeves too) and fell in love! Still wear that one a lot.